The Heard Museum has been awarded a $300,000 grant from The Andrew W. Mellon Foundation to launch a fellowship program centered on care and long-term preservation of Navajo textiles while potentially gaining new insights into conservation techniques. 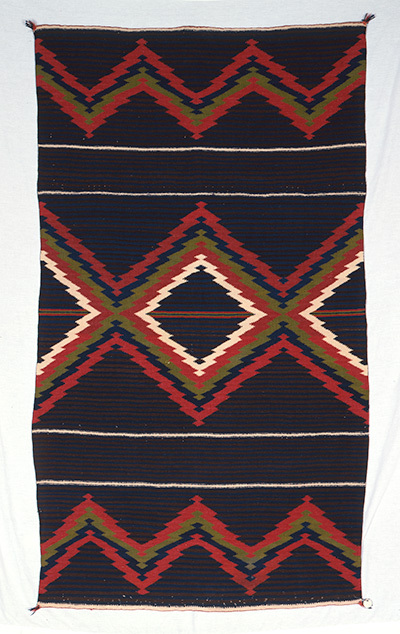 The new program Opening A Window: The Andrew W. Mellon Fellowship Program will provide indepth, paid training and the opportunity to work with Navajo weavers, museum curatorial staff, conservators and textile specialists in assessing and conserving the museum’s world-class collection of Navajo textiles. In conservation, “opening a window” refers to the practice of finding a small sample site for testing. The Heard is committed to reaching candidates who may not fit the traditional higher-education model for fellows. In order to create new leadership opportunities, the Heard will open the Mellon Fellowship to both university students and applicants who have not attended college but have demonstrated a strong commitment to American Indian art and museums. Application information is located on our employment page. 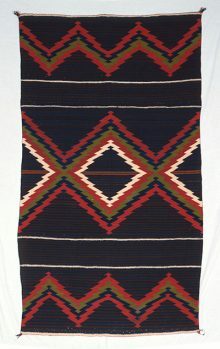 Navajo Textile, circa 1870-75. Fred Harvey Fine Arts Collection, Heard Museum, 271BL.